If you are interested in turning your internship into a job offer, it’s important to know exactly what employers look for when hiring new full-time employees. In addition to relevant skills, employers seek employees who have personal values, characteristics and personality traits that spell success. Good personal values are what makes the foundation for a good employee. Internships are an excellent time to show employers that you have the personal traits they value in their employees. Do not make the mistake of missing an opportunity to show your supervisors at your internship that you have what it takes to be successful on the job, as well as possessing the personal characteristics they value. An internship is an opportunity to learn the skills and behaviors along with the work values that are required to be successful in the workplace. Employers value employees who understand and possess a willingness to work hard. In addition to working hard, it is also important to work smart. It means learning the most efficient way to complete tasks and finding ways to save time while completing daily assignments. It’s also important to care about your job and complete all projects while maintaining a positive attitude. Doing more than is expected on the job is a good way to show management that you utilize good time management skills and don’t waste valuable company time attending to personal issues not related to the job. Downsizing in today’s job market is quite common, so it’s important to recognize the personal values and attributes employers want to improve your chances of job security should a layoff occur. Employers value employees who come to work on time are there when they are supposed to be and are responsible for their actions and behavior. It’s important to keep supervisors abreast of changes in your schedule or if you are going to be late for any reason. It also means keeping your supervisor informed on where you are on all projects you have been assigned. Being dependable and responsible as an employee shows your employer that you value your job and that you are responsible for keeping up with projects and keeping them informed of the things that they should know about. Employers seek employees who take the initiative and have the motivation to get the job done in a reasonable period of time. A positive attitude gets the work done and motivates others to do the same without dwelling on the challenges that inevitably come up in any job. It is an enthusiastic employee who creates an environment of good will and who provides a positive role model for others. A positive attitude is something that is most valued by supervisors and co-workers, and that also makes the job more pleasant and fun to go to each day. Employers seek employees who are adaptable and maintain flexibility in completing tasks in an ever-changing workplace. Being open to change and improvements provides an opportunity to complete work assignments more efficiently while offering additional benefits to the corporation, the customer, and even the employee. While oftentimes employees complain that changes in the workplace don’t make sense or makes their work harder, oftentimes these complaints are due to a lack of flexibility. Adaptability also means adapting to the personality and work habits of co-workers and supervisors. Each person possesses their own set of strengths and adapting personal behaviors to accommodate others is part of what it takes to work effectively as a team. By viewing change as an opportunity to complete work assignments in a more efficient manner, adapting to change can be a positive experience. New strategies, ideas, priorities, and work habits can foster a belief among workers that management and staff are both committed to making the workplace a better place to work. Employers value employees who maintain a sense of honesty and integrity above all else. Good relationships are built on trust. When working for an employer, they want to know that they can trust what you say and what you do. Successful businesses work to gain the trust of customers and maintain the attitude that “the customer is always right.” It is the responsibility of each person to use their own individual sense of moral and ethical behavior when working with and serving others within the scope of their job. Employers look for employees who require little supervision and direction to get the work done in a timely and professional manner. Supervisors who hire self-motivated employees do themselves an immense favor. Self-motivated employees require very little direction from their supervisors. Once a self-motivated employee understands his/her responsibility on the job, they will do it without any prodding from others. Employers can do their part by offering a safe, supportive, work environment that offers employees an opportunity to learn and grow. Working in a supportive work environment and taking the initiative to be self-directive will provide employees with a better sense of accomplishment and increased self-esteem. In an ever-changing workplace, employers seek employees who are interested in keeping up with new developments and knowledge in the field. It has been noted that one of the top reasons employees leave their employers is the lack of opportunity for career development within the organization. Learning new skills, techniques, methods, and/or theories through professional development helps keep the organization at the top of its field and makes the employee’s job more interesting and exciting. Keeping up with current changes in the field is vital for success and increased job security. Self-confidence has been recognized as the key ingredient between someone who is successful and someone who is not. A self- confident person is someone who inspires others. A self-confident person is not afraid to ask questions on topics where they feel they need more knowledge. They feel little need to have to impress others with what they know since they feel comfortable with themselves and don’t feel they need to know everything. Employers value employees who exhibit professional behavior at all times. Professional behavior includes learning every aspect of a job and doing it to the best of one’s ability. Professionals look, speak, and dress accordingly to maintain an image of someone who takes pride in their behavior and appearance. Professionals complete projects as soon as possible and avoid letting uncompleted projects pile up. Professionals complete high-quality work and are detail oriented. Professional behavior includes all of the behavior above in addition to providing a positive role model for others. Professionals are enthusiastic about their work and optimistic about the organization and its future. To become a professional you must feel like a professional, and following these tips is a great start to getting to where you want to go. More companies today encourage employee feedback and offer employees an opportunity to lead in their area of expertise. It gives employees a greater sense of satisfaction and a sense of control over their job. Empowerment encourages employees to do their best work since companies are displaying a trust and expectation that they believe in their employees to do a good job. Offering jobs that encourage learning and the development of new skills also gives employees a sense of empowerment in the workplace. 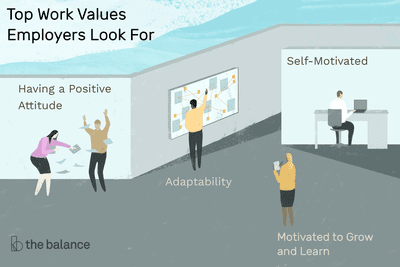 Aligning an employees values with the goals of the organization will foster loyalty and a bond between employer and employee. Fostering good relationships within an organization and offering constructive ways to handle conflict provides a win-win situation for both employer and employee. Creating an organization that values loyalty within the organization can also work to its benefit by using the same techniques and strategies to establish loyalty with customers. And loyalty from customers ultimately makes for a successful business.